I came across this scenario while writing my How to Add Hyper-V Hosts in a Perimeter Network in VMM 2012 R2 post. After adding my Hyper-V Host to my SCVMM installation, I installed the Update Rollup 3 to VMM. However, when doing so, even though the installation itself was successful, the status of the SCVMM Agent installed on my Host showed “Needs Attention” (since the SCVMM Agent was installed off of the original VMM media). 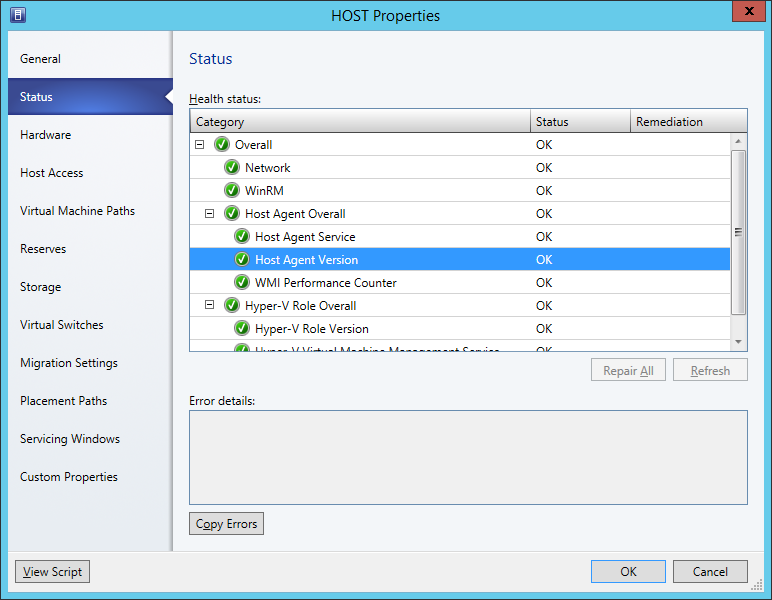 If you select the host and click on the “View Status” button, you will see in the Host Properties dialog under Status, that the Host Agent Version shows a Warning status. 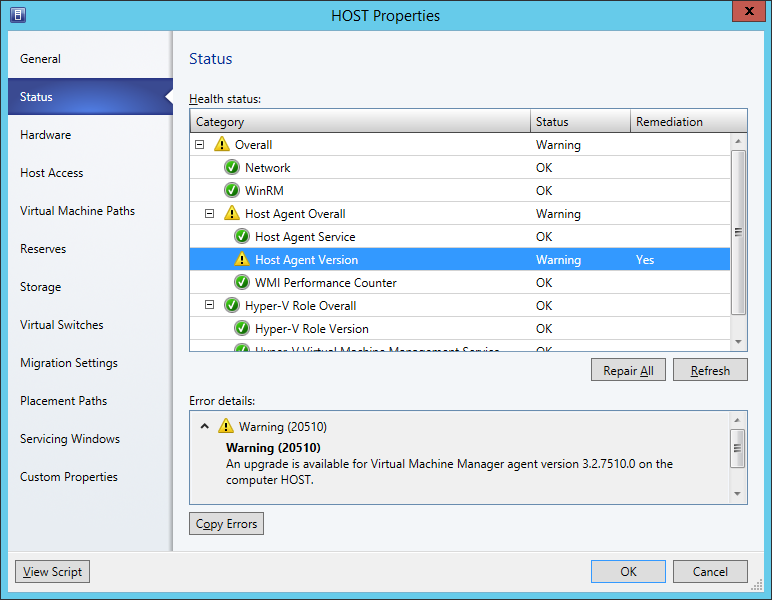 An upgrade is available for Virtual Machine Manager agent version 3.2.7510.0 on the computer HOST. 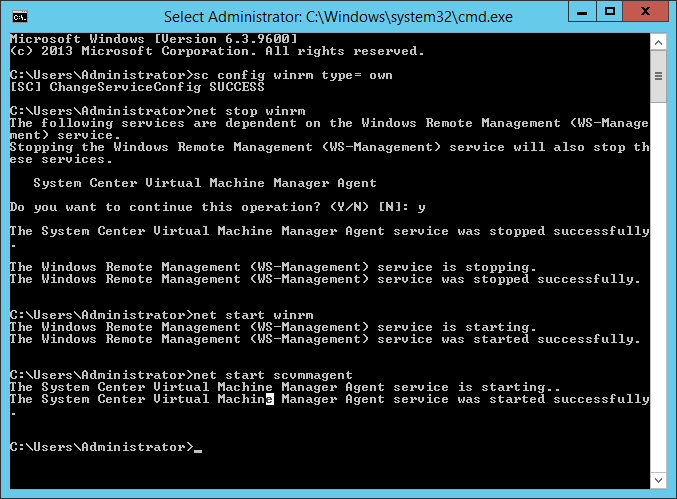 Update the VMM agent, and then try the operation again. You might think that we could easily update the SCVMM Agent (similarly to the SCOM Agent) by clicking on the Repair All button. But if you attempt to do so, and take a look at the Jobs workspace, you will see that the Remediate Host Health job actually failed, with the following error. Virtual Machine Manager does not support updating or re-associating an agent on a host that is in a non-trusted domain or on a perimeter network. If the host is in a non-trusted domain, remove the host (HOST) from VMM in the VMs and Hosts workspace of the VMM console. Then, use the Add Hosts Wizard to add the host and automatically install a new agent. If the host is on a perimeter network, after you remove the host from VMM, you must manually uninstall the VMM agent from the host computer, install a new agent locally on the host, and then add the host to VMM. So, this means we have to uninstall the local VMM Agent we installed from the original VMM media, and install the updated Agent that includes the Update Rollup. But, how do we do that? Where do we get the update files/updated agent? Is it just an .MSP type of update file? After Googling, I was alerted to the location of the updated Agent installer, which will be on the VMM Management Server where you have already installed the Update Rollup (in this specific example, UR3). In my lab example, I have installed SCVMM on the E:\ drive. So my location was: E:\Program Files\Microsoft System Center 2012 R2\Virtual Machine Manager\agents\amd64. Notice that there are 2 folders, one labelled “3.2.7510.0”, and another as “3.2.7672.0”. The 3.2.7510.0 folder contains the original media VMM Agent. If you navigate to the Update Rollup 3 for System Center 2012 R2 Virtual Machine Manager KB article, and check the list of Files that are updated in Update Rollup 3 packages, you will see a reference to the Agent and it’s version of 3.2.7672.0. So now that we know where the updated Agent installer is, what’s left to do? Well, unfortunately, as the instructions indicate, we have to uninstall the existing VMM Agent from the Host, and re-install the Agent using the updated installer (keep in mind that if this is on a Host that is on a perimeter network, then you will have to follow the steps I’ve documented in my How to Add Hyper-V Hosts in a Perimeter Network in VMM 2012 R2 article. As far as I am aware, there is no .MSP-like update that can just be run that will upgrade the Agent. But, if I come across a better method other than uninstall/re-install, I will update this article appropriately. After you follow those steps for installing the updated VMM Agent, the Host Status should show “OK“, as well as the Host Agent Version. If anyone has an alternative solution to updating a perimeter Host VMM Agent without uninstall/re-install, please contact me (via the About Me page) and I will include it in this article (with appropriate credit).